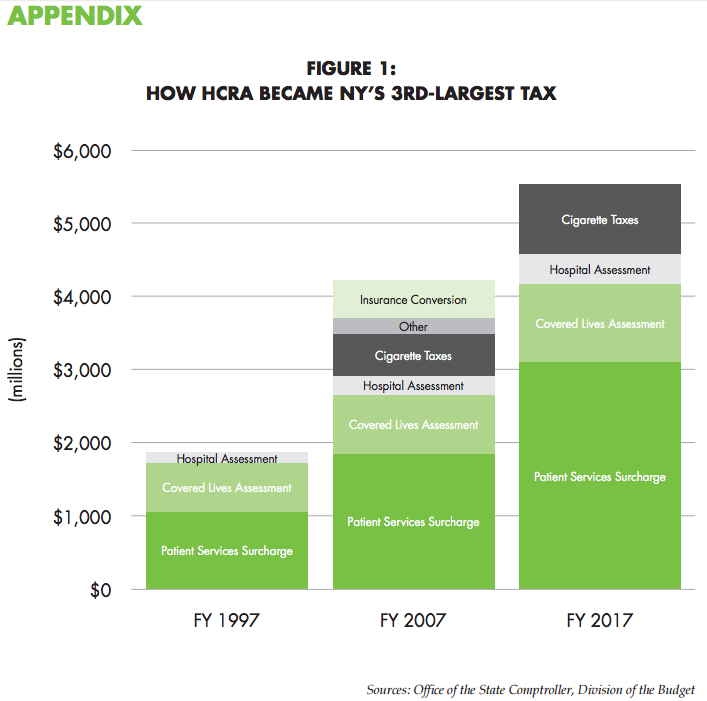 The Health Care Reform Act (HCRA) began as an effort to bring market-driven change and efficiency to New York’s hospital industry, but has evolved into little more than a mechanism for generating revenue. HCRA’s combined surcharges on health insurance and cigarettes have nearly tripled in size over the past 20 years, and now rank as the state’s third-largest tax. HCRA’s insurance taxes hit working- and middle-class consumers as hard as the wealthy, adding substantially to the cost of health coverage for everyone. 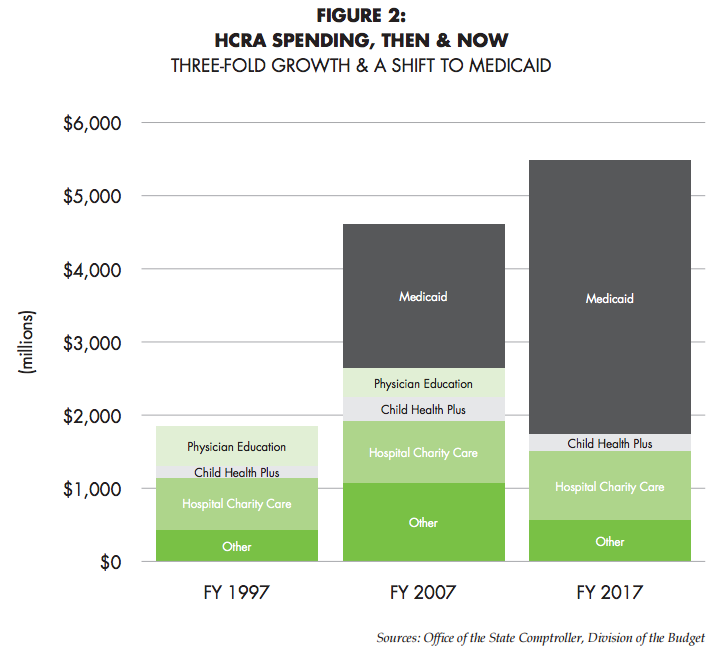 Two-thirds of HCRA funds now flow into the Medicaid budget, accounting for 17 percent of the state’s contribution to a program that was formerly financed with general revenues. Other HCRA funds pay for questionable purposes that do not directly contribute to improving patient care or broadening coverage — such as subsidizing doctors’ malpractice costs and boosting health-care workers’ pay and benefits. Belying its name, the almost $1 billion HCRA-supported Indigent Care Pool distributes money to hospitals based not on how much free care they provide to the uninsured, but mostly on how much aid they have received in the past. Two decades ago, New York State deregulated hospital fees in hopes that market forces would tame spiraling healthcare costs. In the name of smoothing the transition, the law provided hospitals with extra aid financed with special taxes on health plans and medical services. Almost immediately, the state’s per capita hospital spending and employment levels — which had been the highest in the nation — gradually moved closer to the norm, saving billions of dollars for New York taxpayers and consumers. It was a turning point that then-Gov. George Pataki aptly dubbed the Health Care Reform Act, also known as HCRA (“hick-ruh”). As the law marks its 20th anniversary, however, it’s hard to find any “reform” left in the Health Care Reform Act. Beginning with its first renewal in 1999, HCRA has been transformed from a vehicle for positive change into a revenue source for the status quo. Rather than phasing out the original taxes, lawmakers repeatedly extended them, hiked them, and added new ones. HCRA receipts now total $5.5 billion per year, making it the third-largest tax in the nation’s highest-taxed state. Collected in ways that hide them from public view — and that vary from one part of the state to another — the surcharges add as much as 6.2 percent to a typical family’s insurance costs, compounding the pain of skyrocketing premiums and deductibles. And HCRA taxes make no allowance for ability to pay — squeezing just as much from families in the working and middle classes as from the wealthy. Nor is all the money spent effectively. State lawmakers have funneled HCRA funds into programs that have little or nothing to do with direct patient care — such as subsidizing doctors’ malpractice premiums, boosting pay and benefits for health-care workers, or simply plugging holes in the state budget. Today, two-thirds of HCRA monies flow into the state’s Medicaid health plan, which is now available to people with incomes up to 138 percent of the federal poverty level. Those revenues cover 17 percent of the state’s cost for the program, which formerly was entirely financed with general tax revenues. Delivering safety-net care to the uninsured — which was one of the law’s original purposes — accounts for an ever-smaller share of the HCRA budget. Even that amount is spent haphazardly at best. An analysis of HCRA’s so-called Indigent Care Pool, which distributes about $1 billion per year, shows that it pays some relatively well-off hospitals two, three, or four times the cost of the free care that they provide, while safety-net institutions doing the bulk of the charity work get pennies on the dollar. Meanwhile, the law’s complex structure has undermined accountability and fostered corruption. For many years, lawmakers earmarked seven-figure pots of HCRA money for legislative leaders to dole out as they wished, with virtually no oversight — a practice that played a key role in the federal corruption conviction of longtime Assembly Speaker Sheldon Silver. While the pork-barrel accounts have since been closed, parts of HCRA remain opaque to even the most seasoned observers of the state budget. In the name of “reform,” in short, New Yorkers struggling to afford health coverage are paying billions in regressive taxes to finance programs that do little to improve healthcare — and, in some cases, enable dysfunction. 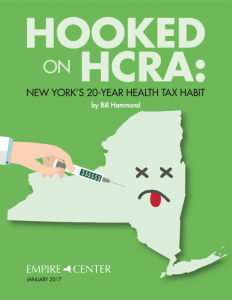 Many of the law’s key provisions, including its major taxes, are due to expire at the end of 2017 — putting the future of HCRA squarely at the heart of the coming year’s budget negotiations between Governor Andrew Cuomo and the Legislature. Lawmakers should take the opportunity to weed out wasteful, politically-driven boondoggles, direct indigent-care dollars where they’re needed most, and enact a long-term plan to wean the state away from regressive health taxes as a major source of revenue. Above all, they should do no further harm — which means rejecting any further HCRA tax hikes or new levies, even in the face of likely funding cuts by Washington. It’s time for New York to kick the health tax habit. The Health Care Reform Act of 1996 grew out of an earlier mega-statute that had gone badly awry: the New York Prospective Hospital Reimbursement Methodology, or NYPHRM (“nye-frum”). Approved in 1982 and first implemented in 1983, NYPHRM was a system of price regulation that dictated the fees charged by almost every hospital in the state. It was mandatory for almost all health insurers — the exception being health maintenance organizations (HMOs), which were a small but growing phenomenon. Under NYPHRM, regulators in the state Health Department established a basic price per day for each of the hundreds of possible medical procedures a hospital might perform, which they then adjusted upward or downward for the patient’s degree of illness, the region’s cost of living, the hospital’s financial condition, and other factors. Fees also varied based on who was paying the bill. For-profit commercial insurers were required to pay the highest rates. Next down the ladder was Empire Blue Cross & Blue Shield, a nonprofit company considered the state’s “insurer of last resort” because it accepted high-risk customers. Medicare paid less than Empire, and Medicaid paid the lowest fees of all. Hospitals were expected to use profits from privately insured patients to offset losses on Medicaid. NYPHRM was a massively complicated system that was the subject of continual political battles at the state Capitol, as employers and insurers fought to keep a lid on rising costs and hospitals and other players angled to increase their revenue. Yet most players on all sides took for granted that the system was generally working to hold down hospital spending in New York. The central thrust of the new law was to deregulate fees paid by private health plans — which were most of hospitals’ collective revenue — thus exposing them to competitive pressure that would help contain costs. The belief was that negotiations driven by market forces would lead to a better balance between what hospitals needed in revenue, and what employers and insurers could afford to pay. • An 8.18 percent “patient services surcharge” on hospital, clinic, and laboratory bills to private insurers (exempting physicians and other providers). Medicaid would pay the surcharge, too, at a rate of 5.98 percent. This would collect just over $1 billion annually in its first years, which was earmarked for charity care and other public health programs. • A flat per-customer fee, or “covered lives assessment,” on private insurance. Most of the $665 million collected in the early years went to fund graduate medical education. In a striking departure from usual practice, the rate of this tax was not consistent throughout the state, but varied from place to place based on the number and size of teaching hospitals in each area. To start, it ranged from a high of $116.75 per insured in New York City to a low of $4.69 in the Utica-Watertown region. Some of the proceeds were also used for other programs, such as expanding Child Health Plus and financing poison control centers. Ultimately, these arguments fell on deaf ears. In early 2000, Pataki and the Legislature agreed on a four-year extension that not only preserved HCRA’s taxing and spending scheme, but dramatically expanded it — setting a pattern that would continue through the next 12 years. 2000: At Pataki’s behest, lawmakers enlarged HCRA with two new revenue streams: a portion of proceeds from a multistate legal settlement with tobacco companies, of which New York was expected to collect $25 billion over 25 years, and the near-doubling of the state tax on cigarettes, from 56 cents to $1.11 per pack. to hospitals for charity care and ramped up spending on anti-smoking programs, among other increases. In an especially significant move, they also drew on $800 million in HCRA funds to finance existing programs, such as Medicaid and Elderly Pharmaceutical Insurance Coverage (EPIC) — in effect, using dollars nominally dedicated to healthcare to plug holes in the overall budget. 2002: With the state’s finances reeling in the aftermath of 9/11, Pataki might have been expected to call for cuts to healthcare spending. Instead, he proposed — and lawmakers approved — an extra $2.2 billion in Medicaid spending over four years ($900 million from the state and $1.3 billion in federal matching funds) specifically dedicated to higher wages and benefits for rank-and-file health-care workers. The extension also increased the share of HCRA funding used to cover existing Medicaid expenses — and thereby balance the budget — to $1 billion a year. To pay for these outlays, lawmakers again hiked the cigarette tax (from $1.11 to $1.50 per pack) and used increased federal Medicaid funding from Washington. In another precedent-setting move, lawmakers also relied on the anticipated proceeds from the conversion of Empire Blue Cross & Blue Shield to for-profit status. By law, a corporation making such a move must compensate the public for the value of assets accumulated while enjoying tax protection as a non-profit. Across the country, this is often accomplished by selling stock in the new company and transferring all or most of the proceeds to a charitable foundation. With HCRA 2002, however, lawmakers opted for the state treasury to receive most proceeds from the conversion of Empire, which would ultimately exceed $1 billion, setting aside 5 percent for what became the New York State Health Foundation. Even by Albany standards, this was an unprecedented “one-shot” — the notorious budgeting practice of using a short-term windfall to finance ongoing expenses. Yet lawmakers would repeat the pattern with the conversions of other insurance companies in the years ahead. 2003: The very next year, facing continuing deficits in the post-9/11 recession, lawmakers boosted HCRA funding again with increases in both the patient services surcharge (from 8.18 to 8.85 percent) and the covered lives assessment; proceeds from more insurance company conversions; and the “securitization” of the tobacco lawsuit settlement, in which the state swapped its ongoing annual payments in return for a lump-sum payout. 2005: Lawmakers again hiked the patient services surcharge (from 8.85 to 8.95 percent) and the covered lives assessment, as well as sweeping in $2.7 billion in receipts from insurer conversions. On the spending side, they established the Healthcare Efficiency and Affordability Law for New Yorkers, or HEAL-NY, which offered $1 billion in grants to providers to finance modernization projects. 2007: In Governor Eliot Spitzer’s first year, lawmakers hiked the covered lives assessment by $75 million and collected $1 billion from insurer conversions. On the spending side, they raised the eligibility ceiling for Child Health Plus from 250 percent to 400 percent of the federal poverty level and established a fund for stem cell research. 2008: As part of Governor David Paterson’s first budget, lawmakers increased the cigarette tax from $1.50 to $2.75 and boosted the covered lives assessment by $70 million. 2009: Lawmakers increased the covered lives assessment by another $120 million and hiked the patient services surcharge from 8.95 to 9.63 percent. They also levied a new $399 million assessment on insurance companies to cover the costs of certain programs formerly financed by HCRA, including Healthy New York. 2010: Lawmakers increased the state cigarette tax from $2.75 to $4.35 per pack. 2011: As part of Governor Cuomo’s first budget, lawmakers levied a $40 million hospital quality contribution assessment on charges for inpatient obstetrical services, to finance a compensation program for babies injured in childbirth. As revenues grew, the spending side of HCRA changed, too — and drifted ever further from the law’s original purpose. The pool earmarked for graduate medical education, one of the two core programs of HCRA 1996, has been left empty since 2009 — even as the tax levied to fill it, the covered lives assessment, brings in more money than ever. Major public health initiatives that HCRA formerly supported — Family Health Plus, Child Health Plus, EPIC, Healthy New York — have either been fully or partially replaced by the ACA and its federal funding. Yet the HCRA taxes enacted to support those programs have gone up, not down. Other programs — including tobacco control efforts launched with much fanfare in HCRA 2000 — have been cut, shifted back to the general state budget, or both. Measured against the central goal of the original law — to control spiraling hospital costs — HCRA has shown at least some success. In the early 1990s, at the end of the NYPHRM era, per capita spending on hospitals in New York was rising faster than it was in the rest of the country. As of 1994, the state’s hospital spending rate climbed to be the costliest among the 50 states and 28 percent higher than the national average. Both of those measures were the same in 1996, when Pataki signed HCRA into law. However, its spending remained 19 percent higher than the national average, leaving substantial room for further improvement. Another sign of progress in the early years of HCRA could be found in employment data. As of 1995, New York had 1,800 hospital workers for every 100,000 people, a rate fully one-third higher than the U.S. norm. By 2002, the sixth year of deregulation, New York’s rate had dropped to 1,730 per 100,000, or 23 percent above the national average. To be sure, New York’s high hospital spending is partly driven by the state’s high cost of living — including wages, real estate prices, energy costs, taxes, and other factors that are far above the national norm. However, New York’s hospitals also lag by measures which they should be able to control. 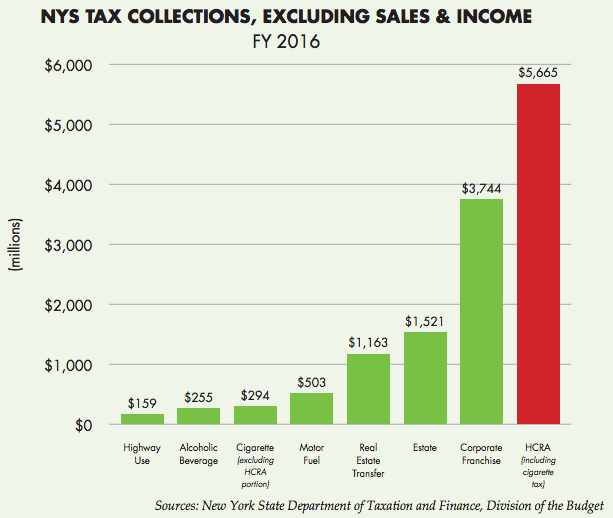 With revenues of almost $5.7 billion in fiscal year 2016, HCRA collections surpassed the estate tax, the real estate transfer tax, the motor fuel tax, the alcoholic beverage tax, and the highway use tax — combined. While insurers are the ones who directly pay the surcharges, the money does not come out of their profits. Under the industry’s accounting regulations, they can and do pass the cost along to customers. Taken together, the total impact ranges from about 3.9 percent of premiums in the Utica-Watertown region, to 6.2 percent in the New York City metropolitan area — the latter being the equivalent of paying for 23 extra days of coverage. These taxes apply to everyone with non-Medicare coverage. Even the government-funded Medicaid program pays the patient services surcharge, albeit at the lower rate of 7.04 percent. By making health insurance less affordable, HCRA taxes work at cross purposes with the policy goal of moving toward universal coverage. For now, the uninsured rate is declining, both in New York and nationwide.20 This is largely due to President Obama’s Affordable Care Act and slower growth of insurance costs for employers. This progress could easily be undone if the ACA is repealed (as seems likely under President-elect Donald Trump) or double-digit premium growth returns to the employer-sponsored insurance market. In that scenario, HCRA could tend to make things worse. Its taxes would add to rising insurance costs, increasing pressure for employers to drop coverage. 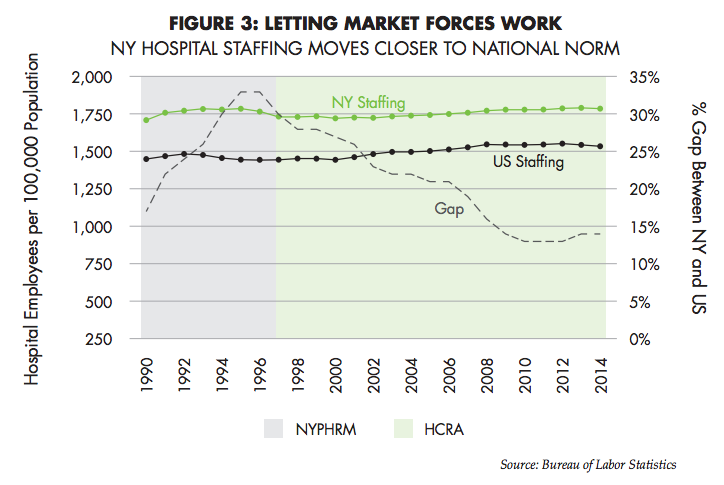 This would lead to higher demand for Medicaid and charity care, more financial losses for hospitals, redoubled demand for state funding, and upward pressure on HCRA taxes — a return of a vicious cycle seen under NYPHRM. HCRA taxes are also highly regressive, affecting all New Yorkers with private health insurance without regard to their ability to pay. The 9.63 percent patient services surcharge, which comes out of what insurers pay to hospitals and clinics, perversely imposes the highest costs on the sickest patients, costs which must then be absorbed by their insurers, employers, and coworkers. The covered lives assessment, which is a flat fee for each insured person in any given region, costs the same for the retail clerk or fast-food worker as it does for a Wall Street executive. State lawmakers designed the assessment this way to avoid compelling Utica residents to subsidize teaching hospitals in New York City that they would rarely use. Now that HCRA funding for graduate medical education has all but disappeared, the assessment revenue is mostly going to Medicaid and other broad, statewide programs. Residents of New York City — or, for that matter, Rochester, where the rate is $104.96 — have a right to ask why they should pay so much more. Another undesirable feature of the HCRA surcharges is that they are hidden from public view. Consumers never see an annual statement of their cost. Instead, they’re invisibly baked into insurance contributions routinely deducted from their paychecks. After a major procedure, consumers might notice the patient services surcharge buried among the many charges itemized on a hospital bill, but it has no clear relation to their copayment or coinsurance. Still, the tax has an undeniable effect — driving up health premiums, adding to the cost of hiring for businesses, and shifting more compensation away from wages and into benefits. Cigarette taxes that finance HCRA are also regressive — in that lower-income people are more likely to smoke — but can come with the offsetting benefit of discouraging people from picking up the habit, particularly children and teenagers with limited money to spend. This is especially true in New York City, where a local levy brings the total tax to $5.85 per pack. Smugglers known as “buttleggers” can buy cigarettes in Virginia (where the tax is 30 cents per pack), sell them on the streets of New York at a steep discount off the legal price, and still turn hefty profits. Both the patient services surcharge and the covered lives assessment are due to expire at the end of 2017. By allowing them to die — or at least starting to phase them out — Governor Cuomo and the Legislature could both make health insurance more affordable and make New York’s tax code less punishing. Not all the programs financed through HCRA have lived up to the law’s promise of “reform.” Some, in fact, have been as regressive and counterproductive as the taxes that pay for them. Problems with HCRA’s spending priorities date back to the law’s origins, when nearly all the money was devoted to two programs aimed at hospitals: a subsidy for graduate medical education and compensation for free care provided to the uninsured and indigent. The former fulfilled a questionable need; the second was spent in ways that prioritized support for institutions rather than patients. Lawmakers phased out the GME portion of HCRA during a budget crisis triggered by the Great Recession in 2008 and 2009.26 Yet the tax created to finance GME — the covered lives assessment — continues at a higher rate than ever. As for HCRA’s charity care program, known as the Indigent Care Pool, criticism has mainly focused not on the purpose, but on how the money is distributed. Ideally, indigent care dollars would “follow the patient” — they would reimburse providers for delivering specific care to specific people. The Indigent Care Pool has never worked that way. Instead, it makes lump-sum grants to hospitals that have provided charity care in the past, or that serve low-income neighborhoods — with no requirement that hospitals use the money for treatment. This is analogous to replacing food stamps with checks written to grocery stores, without requiring stores to account for how much food they give away. As lawmakers expanded HCRA, they devoted a portion of the new revenues to programs that offered state-subsidized, low-cost health coverage for different groups of the uninsured or underinsured. These included Family Health Plus, for low-income parents; Healthy New York, for small businesses and the self-employed; Child Health Plus, for low-income children; and Elderly Pharmaceutical Insurance Coverage, or EPIC, for low-income elderly people. It should be noted that Child Health Plus and EPIC were pre-existing programs that were shifted into HCRA and expanded. In effect, moving them into HCRA helped balance the state budget by freeing up general tax revenues to pay other costs. Of the four programs, only Child Health Plus continues as a major expense. The EPIC program shrank with the advent of drug coverage through Medicare Part D. Family Health Plus was eliminated, and Healthy New York was scaled back, when federally subsidized insurance became available through the ACA. Despite these cutbacks, the HCRA taxes originally levied to support these programs continue at higher rates than ever. Over the years, the burgeoning HCRA budget made room for a long list of other programs, many of which had little or nothing to do with improving the state’s healthcare system. Physician excess medical malpractice: HCRA earmarks almost $130 million per year to subsidize excess medical malpractice insurance for physicians — which was justified as necessary to prevent soaring liability premiums from driving doctors out of the state. Whether high premiums are caused by a broken litigation system or by extraordinary levels of physician negligence, shifting part of the cost to taxpayers solves nothing. Factor in another $952 million in scheduled spending from the Indigent Care Pool — which flows through Medicaid to draw down matching federal funds — and the share devoted to Medicaid amounts to 83 percent. All told, HCRA funding now pays just over one-fifth of the state’s share of the Medicaid budget. However, hidden, regressive taxes on working New Yorkers are the wrong way to finance an ever-larger entitlement program. A better approach would be to squeeze more efficiency from New York’s Medicaid program. While the state has made progress in controlling its Medicaid costs, spending per recipient remains about 25 percent higher than the national average. Narrowing that gap to 10 percent above the national average would save enough money to offset the elimination of HCRA’s contribution. As for other programs currently financed with HCRA surcharges, none is so crucial as to justify further adding to the cost of health insurance. They should be financed with existing, broad-based revenues or eliminated altogether. 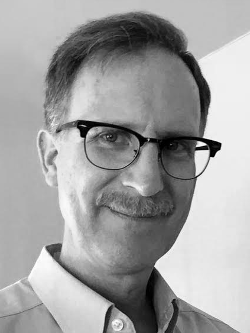 From its beginnings in 1996, a central declared purpose of the Health Care Reform Act has been to reimburse hospitals, at least partially, for providing free care to the indigent and uninsured. The need for such support is clear. Despite recent progress in reducing the uninsured rate, 7 percent of New Yorkers, or more than 1 million people, lack coverage of any kind.34 When these patients seek critical care, hospitals are legally obliged to treat them regardless of ability to pay. Some institutions serving lower-income communities annually rack up millions of dollars in unpaid bills. Failing to compensate safety-net hospitals for this service would jeopardize their financial survival — and the healthcare of hundreds of thousands of New Yorkers. Harder to justify, however, is the state’s methodology for fulfilling this need. Throughout its 20-year history, the Indigent Care Pool has distributed money using arcane formulas in which the amount of free care a hospital provides is just one of many factors, and not necessarily the most important. As a result — as critics have long argued — the system overcompensates hospitals serving relatively affluent communities while shortchanging the safety-net institutions where the need is greatest. Despite two attempts at reform over the past eight years, this criticism remains as valid as ever today. There is, in fact, a small negative correlation between the neediness of a hospital’s patient population and the generosity of its payout from the Indigent Care Pool. (See Figures 4 and 5 in Appendix.) Hospitals serving a higher percentage of Medicaid patients tend to be reimbursed for a lower percentage of their uncompensated care — a reverse-Robin Hood effect. Memorial Sloan Kettering Cancer Center, for example, was credited with providing $3.9 million worth of free care for the uninsured, but was granted $11.9 million from the Indigent Care Pool — a reimbursement of more than $3 on the dollar. At the other end of the spectrum was the New York City-owned Kings County Hospital Center, which provided $111 million in charity care, but collected just $15 million from the Indigent Care Pool — a reimbursement of 14 cents on the dollar. These seemingly topsy-turvy numbers were no accident, but the result of a formula most recently overhauled in 2013. To understand how that formula functions, some historical context is necessary. First, pre-2013 versions of the Indigent Care Pool were designed to compensate not just services provided to uninsured patients, but also “bad debt” — the unpaid bills of patients who had coverage but could not afford or simply failed to pay their share of the cost. Compensation for bad debt flowed mainly to hospitals with large numbers of insured patients. Second, beginning in 2009, the pool also earmarked extra money for charity care provided by nonpublic academic medical centers — the result of a budget fix in which the former pool for graduate medical education was folded into the Indigent Care Pool as a way of drawing down additional federal Medicaid revenue. Third, lawmakers have consistently budgeted separate allocations within the Indigent Care Pool for private and government-owned hospitals, with the latter group receiving proportionally less. As consumer advocates had long documented, these and other measures tended to benefit hospitals serving relatively well-off communities at the expense of safety-net institutions providing the bulk of charity care. Yet industry representatives resisted sweeping reform, on grounds that major shifts might destabilize institutions that had come to depend on the funding. The Community Service Society has further shown that many of the hospitals receiving indigent-care funds were not proactively offering free care to the people who needed it.38 Instead, they were billing indigent patients for their full charges — regardless of how much indigent care funding they received — and in some cases using heavy-handed tactics to collect. In 2008, lawmakers required hospitals for the first time to provide the Health Department with detailed information on the charity care they delivered. However, these data determined distribution of only 10 percent of the Indigent Care Pool. The most recent reforms, enacted in 2013, grew out of recommendations from the Medicaid Redesign Team established by Governor Cuomo. The group further warned about changes in federal regulations accompanying the Affordable Care Act, which said indigent care funding for hospitals should be based on only two factors: how much uncompensated care a hospital provides to the uninsured, and how much they lose treating Medicaid patients due to the program’s low fees. States that failed to comply would risk losing federal aid. In response to those recommendations, lawmakers in 2013 enacted a new formula that includes no explicit provision for bad debt or for teaching hospitals — and uses only the amount of care provided to the uninsured and the Medicaid utilization rate to calculate a “nominal need” for each hospital. For most hospitals, this transition adjustment effectively made the rest of the formula irrelevant. Just more than half of the hospitals, or 93, were guaranteed a minimum amount that exceeded their need-based share — and, in some cases, also topped the full value of their charity care. Another 55 hospitals were capped at a maximum that was less than what they otherwise would have been entitled to, sometimes significantly so. Only 34 hospitals, or one in five, received grants based on the need-based part of the formula. Thus, New York nominally removed bad debt and graduate medical education from its Indigent Care Pool formula — then minimized the impact of that change by adding the transition adjustment. In effect, the state has continued to reimburse hospitals as it had in the past, and diverted money from safety-net hospitals to do so, while continuing to draw federal matching funds. This would seem to run afoul of the spirit, if not the letter, of federal regulations. Meanwhile, lawmakers continued segregating the pool based on ownership. The 2015 budget allocated $971.7 million for private hospitals and $136.2 million for public-sector institutions. Government-owned hospitals collectively delivered 41 percent of the charity care, yet received just 12 percent of the pool funding. Voluntary hospitals delivered 59 percent of the charity care and received 88 percent of the pool funding. In 2015, the hospitals’ nominal need collectively amounted to $2.2 billion, and the Indigent Care Pool had $1.1 billion available to distribute. If the formula had simply allocated the money proportionally by need, each institution would have received about 53 cents on the dollar. Instead, private hospitals collectively received 78 percent of their nominal need, while public hospitals got just 16 percent. Particularly hard-hit by the formula are the 11 hospitals owned and operated by New York City Health + Hospitals. Located in some of the city’s poorest neighborhoods, serving large numbers of undocumented immigrants ineligible for Medicaid, these institutions collectively provide one-third of the state’s charity care — and receive just 8 percent of the Indigent Care Pool funding. Even within the public and private subgroups, the transition adjustment results in vast disparities in funding. Nor are public hospitals treated even-handedly. Westchester Medical Center, which provided $22.2 million worth of free care, received an Indigent Care Pool grant of $8.9 million, or 40 cents on the dollar. By contrast, Kings County Hospital Center provided $111.1 million worth of uncompensated care — the most in the state — and received a grant of $15 million, or 14 cents on the dollar. 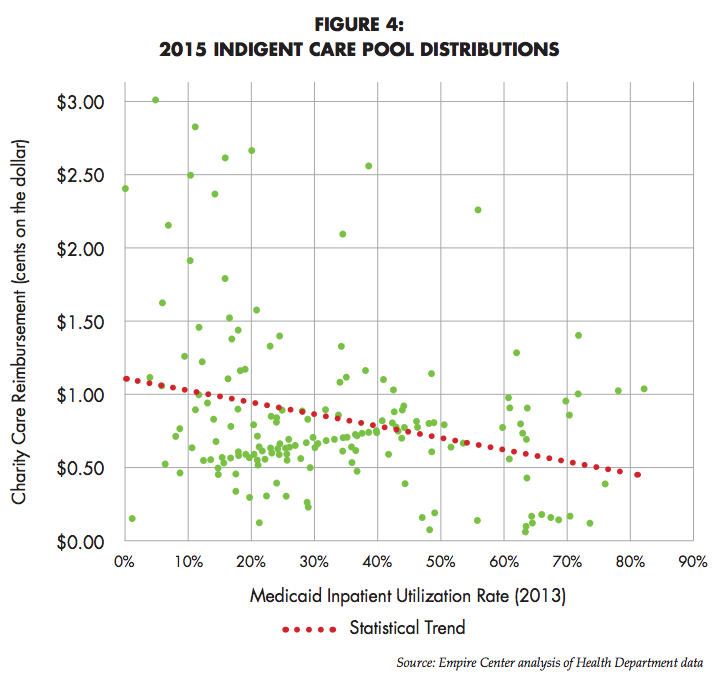 Figure 4 (Appendix) is a scatter plot of Indigent Care Pool distributions, with each dot representing a single hospital. The X axis shows what percent of that hospital’s patients are on Medicaid (an indicator of community poverty), while the Y axis shows the relative size of that hospital’s Indigent Care Pool grant (in cents on the dollar). Instead, most of the dots are scattered across the grid with no clear pattern, starkly illustrating the inequities of the formula — with hospitals at the top receiving far more generous funding than those at the bottom. The red dotted line represents the statistical trend. 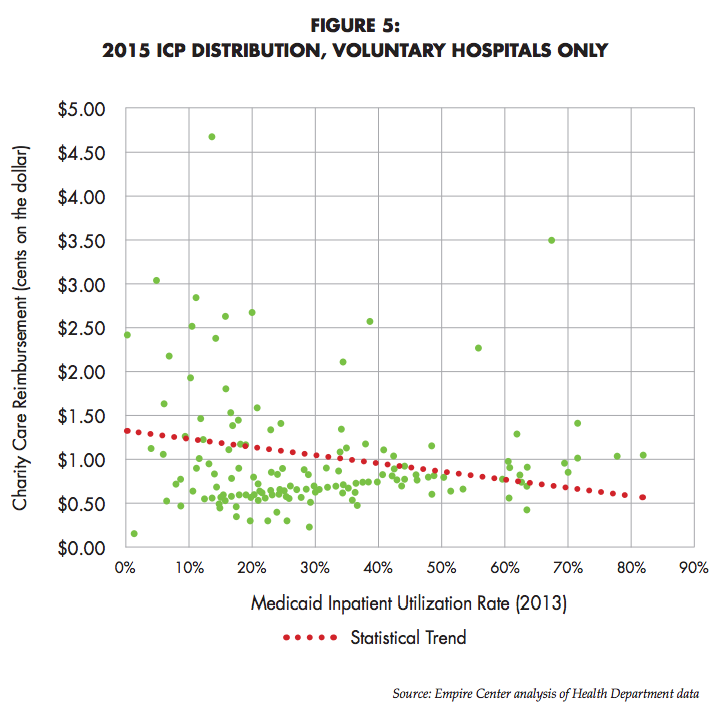 Its downward slope points to a small negative correlation: Hospitals with smaller Medicaid populations tend to get proportionally bigger grants from the Indigent Care Pool, which is exactly the opposite of what one would expect. Figure 5 (Appendix) shows the same scatter plot with government-owned hospitals removed. The trend line still shows a similar negative correlation between need and generosity of reimbursement. It should be noted that demand for charity care from hospitals — the need that the Indigent Care Pool was meant to fulfill— has diminished significantly since passage of the Affordable Care Act in 2010. During that same five-year period, Medicaid discharges increased from 416,607 in 2009 to 713,347 in 2014. Despite the dramatically diminished need, spending by the Indigent Care Pool has stayed almost flat at just under $1 billion (except in 2010, when it spiked to $1.3 billion). As with other HCRA programs, the Indigent Care Pool demands reform — both in where the money comes from, and how it is spent. It should go without saying that the public has a right to know how its tax dollars are spent. When it comes to the billions collected and spent through the Health Care Reform Act, however, following the money can be difficult. It suggested that the state Budget Division might have the information in question. But the Budget Division had earlier directed the Empire Center to the Health Department. A follow-up request to the Assembly for the Pool Administrator data was fulfilled within 36 hours. In a third request to the Health Department, the Empire Center asked for a copy of the spreadsheet documenting the calculation of Indigent Care Pool distributions to hospitals for 2015. That request, filed on November 1, was still pending as this report went to press. For the analysis in this report, the Empire Center used a copy of the department’s spreadsheet that was provided by a knowledgeable third party, who asked to remain anonymous. The lack of transparency is consistent with a tradition that goes back to the law’s beginnings in 1996, when the Pataki administration treated most HCRA revenues, which then amounted to $1.5 billion a year, as “off budget” transfers from insurance companies to hospitals. Since then, governors and lawmakers have moved most HCRA monies into the regular budget and subjected them to the usual fiscal procedures. Lawmakers should not consider extending HCRA in any form without treating all revenues and expenditures as the public funds that they clearly are. If such a system didn’t already exist, it’s hard to imagine many state lawmakers supporting the Health Care Reform Act as it works today. They’d be voting to hike taxes by $5.6 billion per year — one of the largest single-year increases in state history. They’d be voting for taxes that hit the working poor as hard as the wealthy. They’d be voting to use those regressive revenues to cover one-fifth of the cost of Medicaid, a program otherwise financed with broad-based taxes. They’d be voting to make New Yorkers’ health insurance even more expensive, and more of a drag on the economy, than it already was. They’d be voting to spend $1 billion a year on hospital subsidies that are more generous to hospitals in well-off communities than to safety-net institutions in poor neighborhoods. They’d be voting to use healthcare dollars for a raft of other programs that confer special benefits on politically influential groups — such as physicians and certain unionized workers — without directly improving the health of a single New Yorker. They’d be voting to tax cigarettes heavily enough to encourage smuggling, and then to dedicate none of the revenue to help smokers quit. Such a plan would be unlikely to get much support from any party. Yet that is the messy reality of HCRA as it marks its 20th anniversary. The law did not arrive at this point overnight, nor will unraveling it be politically easy. It means upsetting the status quo, rescinding benefits for influential interest groups, and giving up billions in revenue — the last being especially tricky given the uncertain future of federal funding for Medicaid under a Trump administration. This year, however, there is no avoiding a vote on HCRA as it exists today. The pending expiration of surcharges at the end of 2017 forces Governor Cuomo and the Legislature to make a choice: They will either begin reforming the Health Care Reform Act, or perpetuate an indefensible status quo. First, stop treating HCRA revenues as a slush fund for special interests. Instead of subsidizing the state’s excessively costly medical malpractice system, lawmakers should do something to fix it. Instead of earmarking money for healthcare workers’ compensation, lawmakers should focus only on buying the highest-quality care at the lowest available price. Any programs they keep should be budgeted and paid for in a fully transparent and accountable fashion. Second, find a fairer, more effective way to finance medical care for the uninsured. Money should follow patients, not institutions. Ideally, hospitals and other providers would submit vouchers for uncompensated care that the state would partially reimburse. At the very least, what money is available should be distributed based on who is delivering care, not who has the loudest voice in Albany. Third, commit to weaning the state away from its dependence on HCRA revenues. The surcharges were defensible as a temporary measure to smooth the transition to deregulated hospital rates, but not as a major, permanent source of revenue for the state. Lawmakers should enact a long-term plan to repeal the surcharges, reducing them by a fixed amount each year as programs are either eliminated or moved into the regular budget. Fourth and most important: Do no further harm. That is, any increase to existing HCRA surcharges or creation of new ones must be ruled out. Already facing a shortfall from lower-than-expected tax receipts, Albany will be scrounging for revenue to replace the federal aid it stands to lose if, as seems likely, the ACA is repealed and the Medicaid expansion is rolled back. But regressive taxes — especially ones that make health insurance even less affordable for employers and the middle class — would be the wrong way to go. Let 2017 be the year New York faces up to, and begins to kick, its unhealthy health tax habit. John Rodat, “Hospital Reimbursement Revisited,” Empire State Report, March 1994. Chapter 639 of the Laws of 1996. Op. cit., Public Policy Institute. Legislative history drawn from bill text; Division of the Budget financial plans; Office of the State Comptroller, “The Health Care Reform Act (HCRA): State Fiscal Years 2002-03 and 2003-04,” October 2004; and a slide deck prepared by the Health Department for the Health Care Reform Act Modernization Task Force, May 2015. Excellus BlueCross BlueShield, “The Facts About Taxes on New Yorkers Who Purchase Private Health Insurance,” Fall 2015 (www.excellusbcbs.com) and data provided by the New York State Conference of Blue Cross and Blue Shield Plans. Office of the State Comptroller and Division of the Budget. Office of the State Comptroller cash basis reports. Details of the calculation of Indigent Care Pool distributions for 2015 are drawn from a Health Department spreadsheet obtained by the Empire Center from third party. Roosa S. Tikkanen, Steffie Woolhandler, and David Himmelstein, “The New York Indigent Care Pool: Is there a relationship between hospital allocations and uninsured patient volumes among New York City hospitals?” Poster presented at American Public Health Association Annual Meeting and Expo, October 29 to November 2 in Denver, Colo.
Op. cit., Health Department spreadsheet. Op. cit., Tikkanen et al. Statewide Planning and Research Cooperative System (SPARCS), accessed at Health.Data.NY.gov. New York State Executive Budget 2003-2004, Appendix II, p. 164. New York State is hooked on taxes on healthcare services and insurance plans. NYers struggling to afford health coverage are paying billions in regressive taxes for programs that do little to improve healthcare.